After you study this guide, you will be able to plot out an investment plan that is tailor made for your specific situation using low-cost mutual funds and ETFs. This guide includes unique ideas on how to pinpoint the right funds, when to buy them and when to sell them. We will look at a number of different investment strategies with nuts and bolts “how to” steps. We’ll also look at the pros and cons of each method so you can decide what works best for you. Keep in mind that I am not suggesting you use the rules I present here verbatim. Instead, learn and understand what I share here, apply your own filters and get to work. I’ll also present some great resources you can use to make sure the investment rules you set up are consistent with your own investment objectives. For our purposes, let’s assume that you’ve identified a bucket of money to invest for growth (and potential monthly additions to it) clarified your risk tolerance, learned how funds and ETFs work and have created your universe of investment candidates. The next question is what to buy, when to buy, and how long to keep your holdings. That’s what you are going to learn by studying this guide. For purposes of this discussion, we’ll restrict our discussion to mutual funds, ETFs and index funds. That means we won’t be tackling the issue of picking individual stocks. That may be the topic of future posts but it is far too involved to cover here and it is not appropriate for most beginners anyway. There are two ways to maximize the value of this guide. First, you can create your own investment strategy based on what you learn here. If you do that, I strongly suggest you back test the method you come up with before putting your hard earned dollars at risk. There are many sites that offer this service. Just search for “back test mutual fund investing” and you will find several. Usually, they charge a monthly subscription fee but once you are done testing, you can cancel your subscription. While back testing is no guarantee of future results, it’s still a heck of a lot better than flying by the seat of your pants. If you are not the DIY investor type, this guide can still be invaluable to you. Study it carefully and drill any financial advisor you are about to hire (or are already working with). Ask how they use the concepts presented here and if they are not using these techniques to protect your assets, ask why not. Keep in mind that there is no one way to invest that will always be the best way to invest nor shield you from losing money. No investment approach will always beat the market. Every strategy has its pros and cons. Before we get to the nuts and bolts of a few possible mutual fund strategies, I want to tell you how NOT to invest. Some people want to take short-cuts. While I understand that, I also know from my experience that this can be very costly. One such mistake is investing based on your gut. According to my experience, that usually ends up in disaster. You might get a couple of calls right but over a lifetime of investing, it’s usually a loser. Let’s get to work. The first fund investment strategy is structured to invest in the broad market that is performing best. We know that not all markets perform similarly so as one market cools off this strategy should help you find the next best alternative. Of course, there is no guarantee this or any investment strategy can achieve that goal. Remember, your goal is to grow your money over the long-term to achieve your financial goals. Short-term results aren’t important; long-term results are. That doesn’t mean you can buy a few funds and just ignore them for years and years. Indeed, if you are reading this post, it’s because you want an alternative to buy and hold because of its inherent limitations. But no matter what your investment approach is, there will be periods when you will be disappointed. That happens because no one system is perfect. We have to continually remind ourselves of that if we want to stay on track and counter our natural inclinations to react during fearful times. So before doing anything get clear on your investment objective and the time frame over which you want to achieve those goals. Take this step no matter how you invest. I suggest you open your account at a brokerage firm like TD Ameritrade or Fidelity. Many people take issue with that and prefer to open accounts at mutual fund companies instead. I understand that because it can be convenient and cheap. As long as you buy a fund that company offers, it won’t cost you anything. There is nothing wrong with saving a few pesos my friend. But this could be a case where it costs you $10 to save a nickel. Here’s why. If you open your account at a fund company, you can only buy those funds that this fund company offers. That’s a big limitation and if you go this route you forgo other great options. Think of it this way. Would you go to a pharmacy that only offered medications offered by one company? Of course not. You want to have the widest possible access to the best medications possible. The same principal applies to investing. If you open your account at a brokerage firm, you’ll have far more investment choices. While many of them will be free of transaction charges, there will be some funds that charge a small fee when you buy or sell them. So what? Do you really want to be severely restricted in order to save a few bucks? Or, if you decide you do want to have other choices, are you willing to open up 15 different accounts at different fund families all over town just to save a few dollars? It’s just not worth it. Let’s put this in dollars and cents. Assume you have a $50,000 to invest. If you open an account at a mutual fund company, you won’t pay any fees as long as you buy funds on their platform. Of course, you’ll be limited to only those funds that particular fund family offers. But let’s say you open an account with a brokerage firm instead. As I said earlier, in most cases, you can find plenty of no-transaction fee funds at most brokerage firms. But for our purpose, let’s say you will incur 5 transaction fees per year at $15 per trade. That’s a total of $75 for year. If you can find funds at the brokerage firm that perform just 1% better, that would make you an extra $500 which is far more than what you paid for those trades. Do you see my point? Bottom line – don’t restrict yourself to the mutual funds that are only offered by one mutual fund family. You deserve to have the most choices possible and the best alternatives available. Enough said. Let’s move on. Assume you’ve opened your account and you are ready to define your investment universe. In the previous guide I detailed a process by which you can identify funds that you might want to include in your universe as potential selections. There are several thousand funds and ETFs to choose from and if we consider all of them, we could get pretty bogged down. So we have to make things a bit more manageable and slim down the list of candidates which is why I refer you to that post. You can of course expand this universe and drill down to finer gradations of each segment as I said. You can also add in other funds you find using your broker’s fund selection filters. I have purposely not published the symbols for these funds. You can easily find appropriate substitutes and I want to make sure that everyone understands that I am not making investment recommendations. So, these are the indexes we’ll use in our universe. 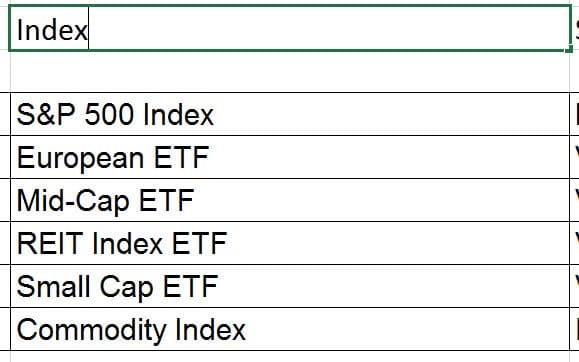 Again, you can use any ETF or fund to represent these indexes and you can add more indexes and funds. Personally, I like to have at least 200 funds in my universe. But I’m illustrating one simple approach with only a handful of funds so you get the concept and then expand on it on later. 4. Calculate the performance of the funds in your universe. 4. Select “Time Period” and input the last 1 year. 5. For “Frequency” select monthly prices. I put the red arrows to point out that the only numbers you are interested in at this point is the date and closing price. 7. Next calculate the return for the month, quarter, last 6 months and year and tabulate the results for each ETF. For example, on 11/1/16, the closing price for this particular ETF was $22.56 per share. On 10/3/16, the closing price was $23.40. So, for the month of October, the fund lost $.84 per share ($23.40 – $22.56). If you take $.84 and divide it by $23.40 (the starting price for October) you can see that the fund lost 4% that month. Of course your results will vary depending on which indexes you follow and the time periods over which you execute this analysis. Want to outsource the process of finding the right strategy and funds for you? Arrange a no-cost consultation with Neal. 5. Determine which fund to buy. Now that you have calculated the performance numbers over the various time periods for the funds in your universe, it’s time to rank your funds. This is where your own personal preferences come to play. Your rules might call for avoiding any ETF if it shows a negative return for that last 30,60 and/or 90 days. Or, you might simply add up the totals and invest in the top 3 or 4 choices. Another option is to provide a stronger weighting to certain periods to emphasize their importance. For example, you might take the 3 and 6 month numbers and double them, add up the totals and then pick the top 3 or 4 with the greatest total figures. If you do that, it gives the 3 and 6 month periods more weight in the ultimate decision. You might also invest 45% of your money in the fund with the highest total, 35% in the fund with the second highest total, and 20% of your money in the fund with the next highest total number. It all depends on your preferences. Again, you need to establish your rules after you carefully analyze lots of data, testing your results and then sticking with those rules. So, if you only invest in those funds with positive results, you would invest 1/3 of your money in the three funds highlighted above. During this particular period, domestic stocks did poorly compared to commodities, real estate and international stocks. If you only invest in the fund with the highest result, you would only buy the European index at the time you ran the numbers. Important point: This is for illustration and it’s historical. This does not mean European or any other specific index is the right place to invests for you at this time. The results change and the illustration is taken from historical data. The cool thing about this approach is that it shifts your money as the market shifts. So with this strategy, you re-run the numbers each month or quarter and rebalance accordingly. That means you would potentially sell one or more funds and buy new funds or shift assets as each fund’s relative position changes. This potentially keeps your assets invested in funds that are performing relatively well. If you decide that owning at least some bond funds works for you, the next question is how to pick those funds? There is no problem using an approach similar to the one above. Just identify ETFs that are proxies for various bond markets, short-term, mid-term, long-term, government, foreign government, corporate, high-yield and international and find the strongest funds within each category. Should you always be invested? Sometimes the overall market is weak. When that is the case, it might make more sense to refrain from investing completely and keep your powder dry. If you want to do that, one method some investors use is to compare each fund to its 200 day moving average. If the current price is above that line, it might be OK to invest. But if the fund is below that line, you might not buy it even if it qualifies because of its relative total score. What we are talking about here is using a market filter and you can do that by using a free charting service to plot the current price vs the 200 day moving average (or any other average you decide to use). One site that makes doing this simple is BigCharts.com. Let’s look there to see how this works. First I go to the site and I input the symbol I am checking – making sure to select “Advanced Chart”. 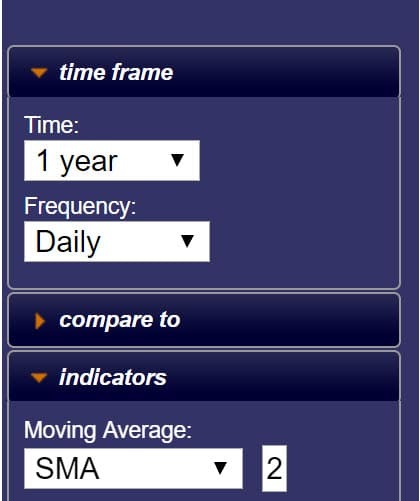 Once the advanced chart comes up, I select “Indicators” and choose SMA (simple moving average) and type in 200 (you may not see all the digits, but they are there). The black line shows the fund’s daily performance and the smooth gold line shows the 200 day moving average. I drew the red arrows to point out how you might use this graph. Basically, when the black line drops below the golden smooth line, the ETF has fallen below its 200 day moving average. If your rules include this filter, you may want to sell. Likewise, once the fund rises above the average, you may want to invest. Can A Market Filter Improve Performance? Below, you’ll see several graphs that show a hypothetical system using a market filter similar to the one discussed above but with some slight tweaks. The red line shows the yearly performance of the S&P 500 buy and hold. The blue line shows the performance the S&P 500 but only holding that index when the market is above the average used in this model. 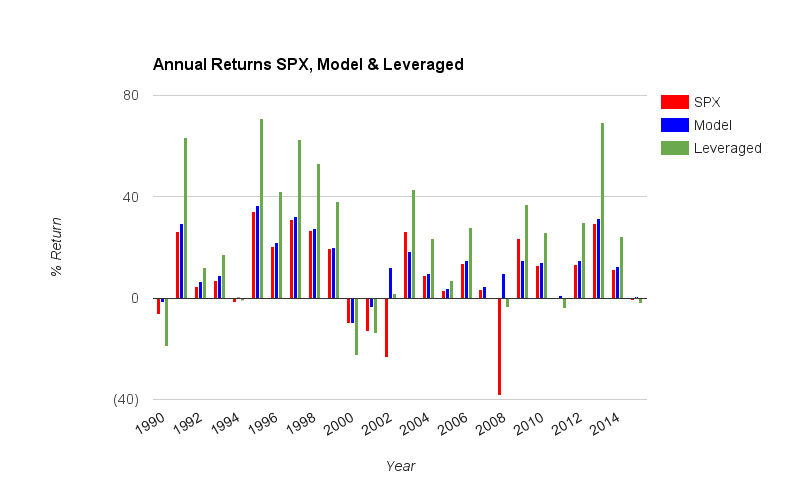 The green line shows the performance of an S&P 500 leveraged fund only held when the current price is above the average. You can see that this system does not provide an annual return that is always positive or that always beats the market. But the results are very interesting, right? The graph above shows 10 year rolling performance of the system described above (blue line) vs buy and hold (red line). In most of the 10 year rolling periods the market filter added a great deal of value if you stuck with your system for the entire ten years. But during long bull markets, buy and hold was marginally better. This makes sense as a market filter sometimes gets you out of the market when you should stay invested. Still, given the added value and protection this particular system delivered hypothetically, it was worth it to pay the “insurance” of giving up a little return during extended bull markets in exchange for having a system to potentially protect you from bear markets. And because going forward, one never knows when the next bear market is going to hit, and how hard the hit is going to be, that potential protection could be very valuable. I am presenting this to you to show you the potential benefits on utilizing market filters and why you might consider doing it. I am not advocating you implement this specific system. Backtested performance is not an indicator of future actual results. There are limitations inherent in hypothetical results particularly that the performance results do not represent the results of actual trading using client assets, but were achieved by means of retroactive application of a backtested model that was designed with the benefit of hindsight. The results reflect performance of a strategy not historically offered to investors and do NOT represent returns that any investor actually attained. Backtested results are calculated by the retroactive application of a model constructed on the basis of historical data and based on assumptions integral to the model which may or may not be testable and are subject to losses. Backtested performance is developed with the benefit of hindsight and has inherent limitations. Specifically, backtested results do not reflect actual trading, or the effect of material economic and market factors on the decision making process, or the skill of the adviser. Since trades have not actually been executed, results may have under- or over-compensated for the impact, if any, of certain market factors, such as lack of liquidity, and may not reflect the impact that certain economic or market factors may have had on the decision-making process. Further, backtesting allows the security selection methodology to be adjusted until past returns are maximized. Actual performance may differ significantly from backtested performance. This is not a fool-proof system. There will be times where you sell and then have to go right back in. That can and will happen. But the upside is that you may be able to sidestep a terrible bear market, protect your capital and sleep better at night at the same time. Also, keep in mind that the 200 day moving average is not the only or always the best proxy for the market. I use a different marker. I don’t mean to be unkind, but the hardest thing about using a strategy like the Mutual Fund Rotation approach (or any other mechanical method) is your natural inclination to over-ride the system with your feelings. Investing is very emotional for many people and therefore hard to do well. You have to contend with daily swings in the value of your hard-earned nest egg. That can get anyone uptight. I understand that. The system I presented is structured to minimize your emotions as much as possible but it doesn’t eliminate your feelings – especially fear. Yes there are safeguards built in but that’s no guarantee. Safeguards don’t always work. In fact, I can promise you that there will be a time when they won’t. Over the course of your investing career, you will get false signals and that’s going to cost you money. Hopefully, over the long-run, the cost will be worth it but there is no way to avoid that completely. That goes with the territory friend. Sorry. It’s good…but not perfect. Because of that, it might be difficult for you when some terrible headline hits the news and/or your funds significantly underperform or the market hits a rough patch. Even with the best intentions, some investors throw their system out the window and run for cover at the worst possible time. That is a natural thing to want to do. But don’t cave in. If you do, you’ll likely pay a high price over time. First, if you are doing this yourself, back test your system over and over again. Only use a system that has a worst-case situation you can live with. At the same time, it’s important to understand that this is still no guarantee that future downdrafts won’t be worse. The second way to address the problem of investing emotionally is to use a qualified advisor who agrees that it makes sense to invest in stronger funds, to avoid weak funds and avoid weak markets as well. There you have it. A simple investment system you can use or build on with a goal of focusing assets in stronger markets and avoiding weaker areas. Remind yourself that this is about long-term investing and that no system is perfect. Stick with it. Set up your account at a good brokerage firm. Tabulate returns for the prior 1, 3, 6 and 12 months or whatever periods make sense for you. Determine your other investment rules such as weightings, what to do with negative returns, how many funds to buy and whether or not you are going to use a market filter or not. You should only make these decisions based on results you see when back testing. And you must remind yourself that the backtesting is not a guarantee of future performance. As I said, the system I use for clients is more involved. If you want information about that, contact me here. But the bottom line is, the investment method I described above can potentially be far better than buy and hold because it provides objective guidance free of emotional interference. I love the strategy I outlined for you above as I think it fits my clients’ needs as well as my own. But there are many other ways to invest. I read an article in the Investor’s Business Daily about an investment strategy with an interesting twist using country ETFs. In a nutshell, this approach calls for buying those country ETFs with the worst news rather than the best. No it’s not a strategy created by people who love to lose money. Quite the opposite. But before we go any further I want to make one thing clear. Even if you never plan on buying an ETF (let alone a country ETF) this strategy can help you become a much better investor. Let’s take a closer look and see why. As you may know, an ETF is a type of index fund. A country ETF buys and holds stocks that represent the overall economic strength of a given country. This particular strategy is built around behavioral economics. The idea is to gauge broad economic sentiment, interpret the results and then trade stocks accordingly. The surprising conclusion was that extremely negative sentiment can signal a great buying opportunity. In other words, buying country ETFs with the worst sentiment and selling short those country ETFs with the most positive sentiment led to extremely high investment returns (according to the study they reported on). The article pointed out that humans view situations in black and white. When things are bad we convince ourselves that they are terrible, catastrophic and beyond all repair. When things are good we can’t see anything but blue skies ahead. I don’t know about you but this sounds about right to me. We often think about events that are highly unlikely to occur but we behave as though they are inevitable. When we do that we panic and behave irrationally. This investment approach suggests that you identify these kinds of events and bet against that irrational behavior. Should You Use This Investment Strategy? I haven’t seen enough results to evaluate if this is a good investment approach or not. Most important, I like to see how poorly a given strategy does in bad years so I get a sense of how painful the bad times just might be. I’m not suggesting you use this specific approach but I still think the research these people have done can be a priceless tool. This research proves that our feelings aren’t very good indicators of true risk. Let me give you an example. According to the article, Pakistan was touted as a buying opportunity at the time the article was written even though it had done very poorly for the trailing 12 months. Most investors see that red ink and flood the market with sellers. Frenzied selling ensues and prices drop to unreasonable levels. When that happens opportunity raises its lovely head. The flip side of this is equally important if you want to avoid losing a fortune. In September of 2011 gold hit an all-time high of over $1900 an ounce. About that same time everybody and their uncle wanted in. Investors were absolutely giddy for gold. I know because I took phone calls from exuberant investors wanting into the gold opportunity. But in the 2 years since, the price has plummeted 35%. Of course gold isn’t the only bubble that has burst leaving investors holding the bag. Real estate, tech stocks, Apple Shares…you name it. There are plenty of examples. Bottom line? Use an investment strategy that fits you well and stick to it. With all the strength at your command resist acquiescing to your emotions. If history is any guide, this won’t be easy. Human nature is formidable. But if you want to grow your assets safely, keep in mind that your feelings are not facts – and they can be extremely expensive. This particular strategy troubles me because it is not really data driven. The method I described above is and that’s why I prefer it. But again, this could be a strategy that could work for you. And even if it isn’t, it demonstrates how dangerous it is to invest based on feelings. I’ve already explained how different investments work, now let’s consider different approaches to investing. This is important stuff. It’s far more important to get your approach right (for you) than to pick one or two good funds or stocks at any one time. That’s because if you get the approach right, it’s repeatable. But making a lucky call once in a while isn’t something you can count on. There are three different strategies that most people use. My goal is to help you make smarter decisions based on your understanding of these approaches to make more money over the long-run and have a lot less stress starting now. But keep one thing in mind. No matter how you invest, please don’t expect stellar results all the time. And prepare yourself for losses. That’s just the price we pay to achieve our long-term goals. You can point to any investment strategy and “prove” it’s either great or terrible by manipulating the time frame. What matters most is the long-term results and accompanying risk. Behind every investment pick there is an investment strategy and the strategy is what we’ll discuss – not the stock or fund pick. Before investing make sure you understand your time-horizon. Rule #1. You aren’t allowed to try to predict the future or listen to someone else who does. Rule #2. You aren’t allowed to change your investment time horizon just because the market or political situation changes. Obviously, if your personal situation shifts, you’ll have to adjust your investing strategy. But if you shift your investments based on nothing more than your feelings about the economy/market/whatever, that’s just breaking Rule #1. Rule #3. You can’t win them all. Every decision has its benefits and drawbacks. You have to accept that you will suffer losses in order to gain the long-term benefits of any investment strategy you employ. Have you ever changed your long-term investments as a result of a political, economic or historical event because you “knew” the market would melt down as a result? If so, you broke Rule #1. Have you ever read about a very promising new stock and bought stock based on their very bright future without doing any research? Or have you ever said, “I know the market will never come back from this” and sold out? If so, you also broke Rule #1. Have you ever complained about the low interest that banks pay? That’s breaking rule #3. You wanted the safety of the bank but aren’t willing to accept the downside – low interest. You see? Adhering to these rules isn’t easy – but necessary if you want to achieve long-term results. Using these three rules, we’re going to proceed and take a deep dive into three investment methods: asset allocation, buy and hold and timing the market. You probably already understand the benefits of not putting all your eggs in one basket, right? If so, you understand the basics of asset allocation. Yay! People who invest using this concept have a variety of different funds in their account representing different indexes or areas of the market like large cap, mid cap, international etc. But since asset allocation calls for having fixed percentages of their account in specific parts of the market, these investors have to tweak their holdings periodically. Let me clarify this by way of example. Let’s say your asset allocation model calls for you to hold 10% of your account in large cap index funds, 10% in international and the other 80% in various other funds and that you start with $100,000. That means you’d invest $10,000 in large cap and $10,000 in international and $80,000 in other funds. Assume that by the end of the year, large cap did particularly well relatively to your other positions and is now worth $12,000. If the total account value is still $100,000 at the end of the year, it means you have 12% in large cap and that’s too much. Going back to our example, assume that international, is only worth $8000 and makes up 8% of the total account at the end of the year. If you were an asset allocator, you would sell off $2,000 of the large cap and buy $2,000 of the international fund to bring the holdings back into line with your 10% targets. If you noticed, using this approach, you sell high and buy low. Selling off some of the positions that do well (which appreciated in price) and buying other positions that fell in price and are cheaper. Asset allocators invest this way because they feel that nothing does well forever and it’s impossible to predict when any one index will do better than the other. This technique takes all the guess work out of investing because it has lots of eggs in lots of different baskets and they are constantly being updated. Asset allocators might hold bond funds, real estate funds, commodities etc. It depends on how much risk the investor is willing to take. The more aggressive you want to be, the more you would skew your allocation towards equity. If you are interested in taking less risk, you might put more in fixed income. According to Wikipedia, during the 2000 – 2002 bear market, an investor who had 80% in stocks and 20% in bonds lost 34% while an investor with the inverse allocation made 6%. This makes sense. 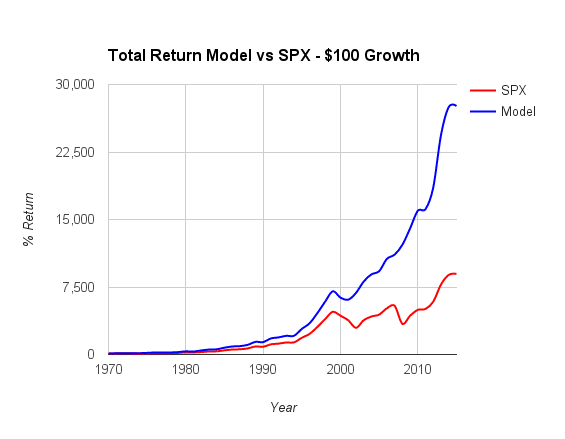 A person with a more conservative portfolio will do much better during very bad markets. Duh. As you can see, asset allocation didn’t help investors that much. 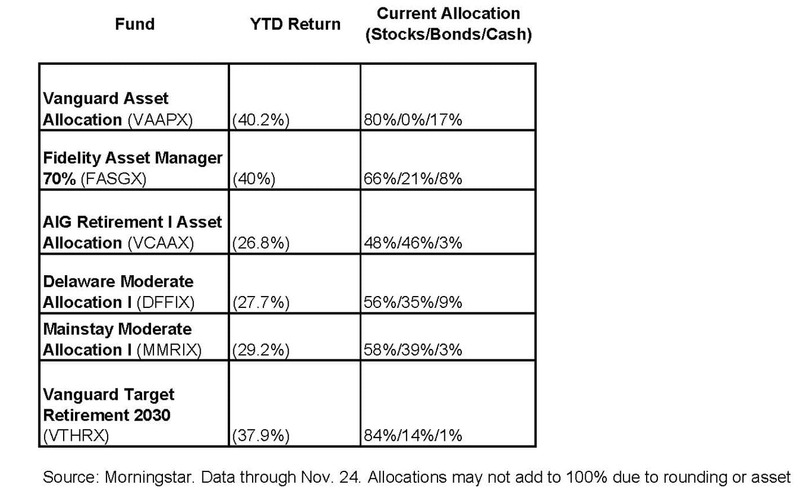 The overall fixed allocation (how much in stocks, how much in bonds) did help. But the periodic rebalancing did not really add value – at least in this case. Asset allocation funds are designed to protect investors against steep losses but you can see that they don’t always do the job. That doesn’t mean they are bad funds. It means the concept isn’t foolproof. Of course nothing is perfect. And no investment strategy will work every single time. And it doesn’t make sense to decide about your investments only from the “worst case” standpoint. That would have you keep all your money in the bank and probably not achieve your goals. The real benefits of asset allocation are that they take the emotions out of the process, it leads to a diversified portfolio and can help protect investors from losses at times. But there are also downsides. First, many investors are under the impression that asset allocation shields them from danger and risk and that’s just not true as we saw above. On top of that, this approach sells off the strongest funds and buys the weaker ones. I prefer to buy more winners and sell off losers. That’s why I’m not a big fan of asset allocation with static percentages. Let’s move on. Buy and hold sounds simple enough; You buy an investment – you hold on to it. That’s it. What could be simpler than that? Lots of people say they are buy and hold investors. The problem is, very few people can actually do it. Buying is easy. Holding is the difficult part. That’s because at some point, people’s emotions get control over them. As a result, they make emotional decisions and override their “buy and hold” strategy. Often, this happens at the worst possible time. This shows that when times are hard (as depicted in the first column) it’s really tough to focus on the long-term. Look at 2008. Most people were thinking about 39% loss instead of the 25-year average gain of 9.61%. That’s natural. I get it. But it often leads to decisions that make your financial situation far worse. Rule #2. You aren’t allowed to change your investment time horizon just because the market or political situation changes. Rule #3. You can’t win them all. Buy and holders often find it difficult to honor these rules when the market hits a rough patch and that’s why the strategy fails. When times are good, it’s easy to have a long-term view. But when the bear market hits, people often shift their time frame (see Rule #2), decide that the market is going to continue falling (see Rule #1) and forget that every investment fluctuates in value (see Rule #3). Consider the rolling 10-year periods over the last 75 years. 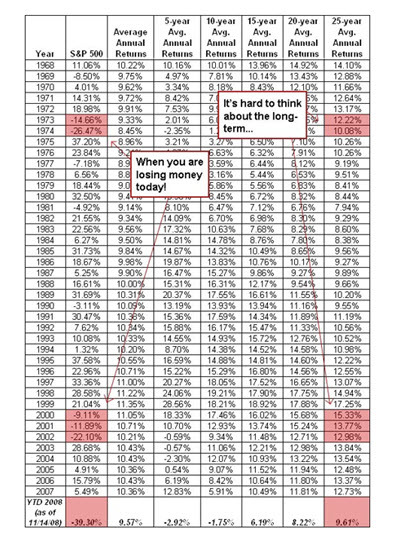 The market has gone up 95% of those 10-year periods. 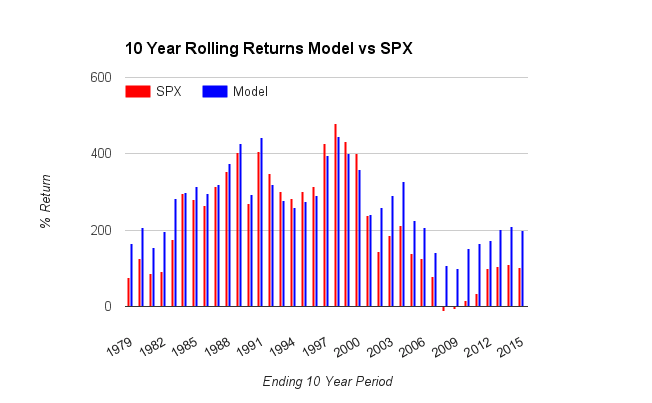 So, if you are investing over a 10-year period, isn’t buying the S&P prudent? Of course it is. Even though 5% of the time, the 10-year hold lost money, so what? Should you build your future with the odds in your favor (95%) or should put everything on the line based on the 5% outliers? Buy and hold can work in theory. But I believe that the emotional build-up is too great a force to overcome for many investors. In other words, this approach doesn’t fit most people’s mentality. Let’s consider a third alternative that might. Many investment professionals will tell you that market timing is risky and doesn’t work. For the most part, they are right. But it depends on how you define “market timing”. In my experience, there are strategies which, when employed correctly, may help reduce risk and grow your wealth. Let me clarify. When I say, “market timing” I am not talking about day trading. I’m talking about using objective data to determine when risks are higher (and therefore a good time to become more conservative) and when opportunity is greater (and therefore a good time to become less conservative). This might mean changing your portfolio once a month or once a year – it depends on your technique. At the same time, it’s important to remember that even the best techniques won’t shield you from losses all the time and they won’t beat the market all the time either. This is true no matter how you invest. Let’s take a moment and revisit the purpose of this exercise; to help achieve your long-term goals over the long-term, with the least risk possible. This is not about short-term performance but long-term fulfillment. And before we dive in too deeply, I want to differentiate between adjusting your portfolio based on your gut feeling (see Rules above) vs. using objective, measurable data. If you are going to get in and out of the market based on how you feel when you wake up in the morning, I can’t help you. However, if you can stick with a formula to guide your investment decisions based on objective data, you could be going in the right direction. For example, below is a hypothetical simple moving average system. You buy when the S&P rises above a moving average and you sell when the market drops below its average. 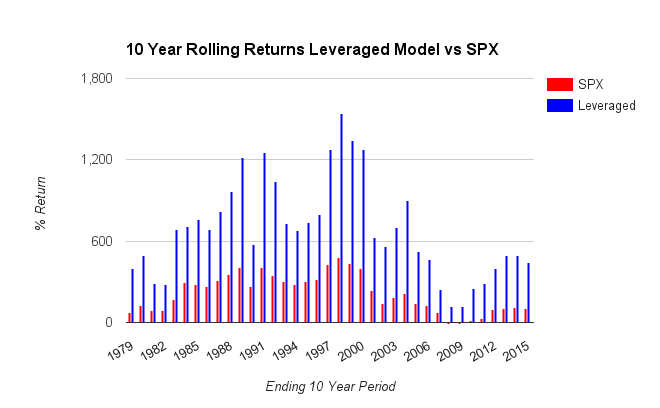 You can see that over the long-term, this hypothetical system has rewarded investors richly. However, this is hypothetical and is not based on real experience. I am only showing this example to explain what market timing is and how it might be used. Also, this hypothetical system beat the market for many years but it didn’t beat the market every year. There were times where this method did worse than the market. There were also years where you would have lost money had you used this technique to guide your investment moves. And there were years when those losses were substantial. Of course, the past is no guarantee of future results. Again, you have to keep our third rule in mind – there is no free lunch and nothing is perfect. In other words, there are timing systems that have done better than buy and hold over the long-run IF the investor was able to stick to the system. Often, people can’t. When you are agitated (either because of external events or because of your personal situation) it’s easy to shift your time frame, think you know what’s going to happen and reject the notion that sometimes as investor, you have to go through hard times. Market timing isn’t for everyone. It may not be for you. And if you do go this route, please expect that there will be periods of underperformance and losses as I said. It may also involve spending more time and learning by trial and error or hiring someone to do this for you. But as we saw above, the right approach could deliver when it comes to risk reduction and help you achieve your goals over the long run. I have already explained that market losses are a part of investing. But big stock market declines do sting. In fact, they hurt you twice. First, when the market crumbles it can take a big chunk of your money with it. And if you’ve ever gone through a steep market decline, the mere thought of going through another one might make you gun-shy with your money. As a result, you might invest far too conservatively for years thereafter. That often ends up costing you more than the loss you incurred during the market drop itself and it’s one of the big problems buy and hold investors face. It would be great if there was a way to grow your money while reducing the risk. Is it possible to invest with a safety net to help you get out before the market implodes? Is that asking for too much? Of course there is no fool-proof investing method. Everything has risk, but some people try to time their investing by using moving averages. This is a type of trend following method. And some (but not all) of these people have great results*. Again, there are no guarantees – but let’s take a closer look to see if this strategy holds any water. This is just an average price of a stock or index. To illustrate what a moving average is, let’s look at the 200 day average for the S&P 500 index. 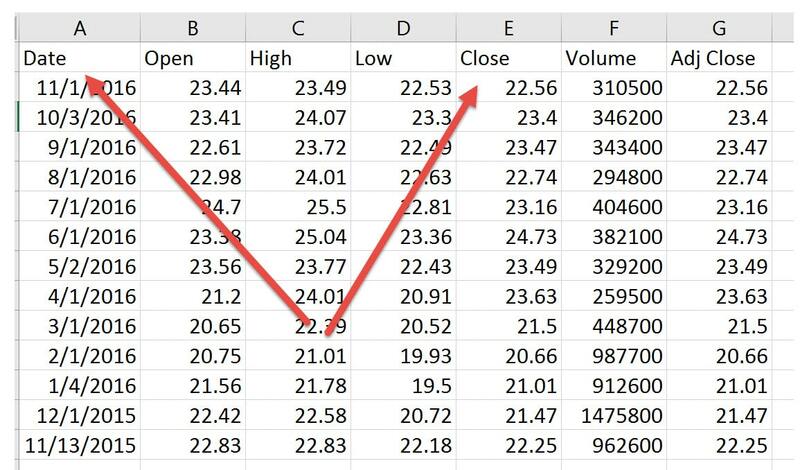 All you have to do is add up the closing prices of the index for the past 200 days and divide that result by 200. Each day you update this by adding the most recent day and dropping the oldest date. Then you plot the results on a graph and compare it to the current price of the stock or index. That’s all there is to it. Check out the graph below. The solid red line is the moving average while the squiggly blue line is plots the daily price. You can use these moving averages to help you decide to buy or sell a stock or index fund. What some people do is buy an index fund when the daily price is above its 200 day moving average and sell if the current price is below the average. 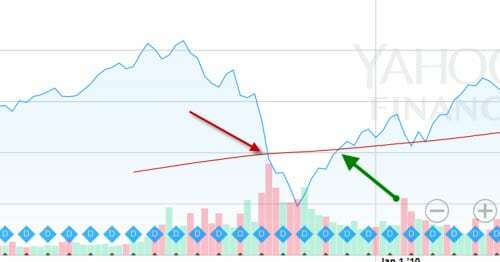 You can see that as the blue line goes below the red line, the investor would sell and once it goes above the red line, the investor buys the index fund again. What Have Been The Results Of Using This Buy/Sell Rule? There have been numerous studies that looked at this investment approach and many suggest the system has merit*. I was intrigued by this, especially for investors who depend on their investments for income. This theory was tested by Jeremy Siegel in his book, Stocks for the Long Run. He concluded that an investor who used this strategy with the NASDAQ index from 1972 through 2006 would have outperformed the index by 4% per year with 25% less volatility*. That’s a lot of money Pilgrim. Another study back tested this approach from 1901 through 2012*. They also found that a hypothetical investor using such an approach could have made a lot more money over the entire period. Neal’s Notes. Does this seem like too much work? If so, you may want to hire someone to do this for you. If so, let’s talk. 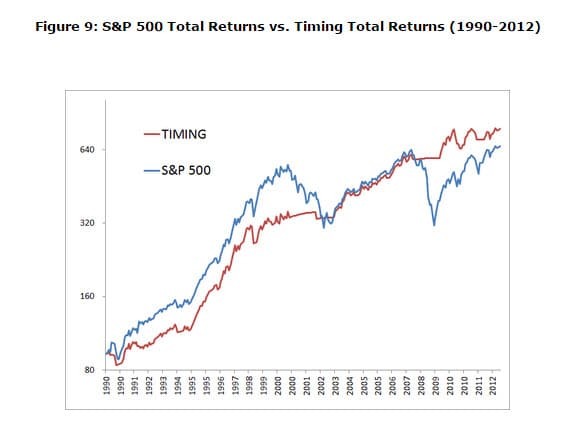 Interestingly, this “timing” approach underperformed the buy and hold investor 50% of the time which is a lot. Specifically, during strong bull markets, the buy and hold investor did better. But during market crashes, the moving average approach protected much more of their capital. It’s really a question of picking your poison. No one approach is better for everyone. Each investor has to weigh the pros and cons and decide for themselves. This approach isn’t for everyone. First of all, the past really is no guarantee of future results. Second, keep in mind that there are many years (one out of two) where this underperforms buy and hold. Also, there are many “false positives” – or times when this system tells you to cash out and it quickly reverses itself. So that short-lived exit and re-entry into the market can be costly. I think this approach can be smart for the right person. My experience tells me that buy and hold often fails because investors are human and often flee frightening situations – that is just our nature. Using this approach, an investor could be shielded from some of those terrifying situations and thereby, stay invested longer. Because it’s simply impossible to know if it’s a good time to invest now or not, some people turn to dollar cost averaging. What is that? Dollar cost averaging is yet a another investment strategy. You can also use this approach in tandem with other investment methods. When you dollar cost average (DCA) you take a fixed amount of money and invest it at set intervals. Usually that means you take the same amount of money and invest it each week, month or quarter. If you have a 401k or 403B – you are already using a form of dollar cost averaging because you invest a little bit each time you get paid. Didn’t know how smart you were…did you? If you are worried about what’s in store for the stock market, this can be a good approach. If the market takes some dips during the investment period you’ll get more shares for every dollar you invest as you’ll see. If the market goes up in a more or less linear fashion over that time you would have been better off had you invested as a lump sum at the very start. If the market sinks like a lead pipe, dollar cost averaging will help you but obviously you’d have been better off had you not invested in the first place. Consider the following example. Joe Investor invests $100 per month for 8 months. The price of the fund starts out at $10 per share but Joe isn’t very lucky. The share price drops $.50 every month. You can see that by the end of 8 months, Joe has invested a total of $800. The good news is that as the share price drops his $100 buys more shares each month. At the start of the period, his $100 only bought 10 shares. 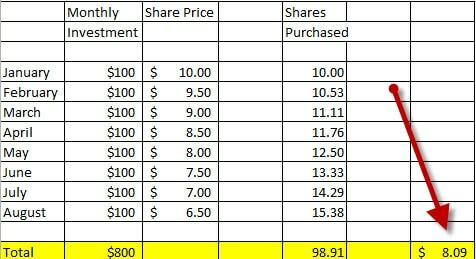 But by the end of the period, his $100 buys 15.38 shares. (Yes…you can buy fractional shares if you buy mutual funds and ETFs). You can see that because Joe used dollar cost averaging his average cost is $8.09 per share. DCA can help investors in other ways too. Namely, it allows people to slowly put their feet in the water rather than jump in with both feet. This gives many people the opportunity to invest without worrying if this is the best time to invest or not. That fear keeps a lot of investors sidelined. Dollar cost averaging neutralizes that fear and gets them into the game. Another advantage of this approach is that it takes all your emotion out of the investment equation and gets you to invest systematically. I’m all for anything that does that. This is just a huge psychological benefit that it’s hard to overestimate its value for the right person. If you are interesting in putting Dollar Cost Averaging to work for you, find a good online broker. The right one can offer an inexpensive and automated way to implement this strategy and they also provide some great tools to help you plan for the future. Is Dollar Cost Averaging For You? If you are conservative and risk-averse, DCA can be a wonderful technique as I explained above. If you are not overly risk-averse, it’s really a coin toss. If you look back over the last 3 or 4 year, dollar cost averaging would have been a mistake from a financial standpoint. The market has done really well and it’s been fairly consistent. That means the investor who put his or her money in earliest is the biggest winner. But if somebody evaluates DCA this way, they miss the point I believe. Nobody knew what the market was going to do over the last several years and nobody knows what the market is going to do in the next several years. That being the case, the best way for you to decide about dollar cost averaging is to consider how much risk you are comfortable taking and move ahead accordingly. You can also use this technique if you are withdrawing funds from your account too and it can be powerful. I’ll give you a real-life example of someone who didn’t use this and should have. It illustrates how cool dollar cost averaging can be on the withdrawal side as well. In the mid-90s a good friend of mine was working for a small software company and on top of his meager salary he was given share options to entice him to stay. After several years, the options were worth about $1 million. My friend decided he wanted to go to law school at that time. He cashed in all his shares in one fell swoop and used the money as he needed it to support his family and pay for school. Was it a mistake? At the time, tech stocks were going crazy and his account values were growing every day. I suggested that he sell off just enough to pay for his expenses over the next 12 months and to repeat that process each year. Nobody knew what the value of those shares was going to be and it seemed like selling them all at one time was a big risk. It’s true that he’d take some risk if he used dollar cost averaging to sell. But we figured that the risk didn’t jeopardize his ability to complete law school or care for his family. As it turns out, the small company he worked for was ultimately bought out by Cisco and his $1 million would have been worth several million dollars even after he made his annual withdrawals. So in this case I ended up looking like a genius and my buddy ended up a lawyer. Do the math. The truth is I wasn’t a genius. Nobody knew this was going to happen to the value of those shares. I gave my pal intellectual advice but he had to live with the consequences. That’s why he took all the risk off the table and I really can’t fault him for it. I’m not sure I would have had the grit to hold on to those shares either – even though it worked out to be intellectually sound. If you need a large amount of money over an extended period of time, you can dollar cost average out of the market just as you can to get into the market. This approach takes away the pressure of needing to know the best time to invest or withdraw your money. Is it ever smart to override the system and sell when things look really bad? When the market tanks, it’s no fun. But does that mean it’s time to do something different? Is that the time to sell? The answer is “maybe” because it depends on why you are selling. Let me explain. First, all ships rise and fall with the tide. You might have a fund that’s dropped quite a bit – but that doesn’t necessarily mean you have the wrong fund. If you sell a good fund in a bad market, you might be throwing the baby out with the bath water. Having said that, you might want to sell a fund in a weak market, if your strategy calls for it. The strategy that I use (and shared with you above) happens to be “market sensitive.” That means I buy and sell funds (yes…even great funds) as the market dictates. Based on the criteria in my strategy, I buy and sell at different times. The market might be strong and I’ll upgrade to a better fund. I might upgrade to better performers in a weak market…or I might sell a fund in order to reduce market exposure. I let the system tell me what to do. Is this strategy always better than buy-and-hold? Nope. Over the long run, I believe it is a better fit for my clients, but this approach doesn’t outperform every time. If your strategy is based solely on performance, you shouldn’t care if the fund is run by a monkey or a PhD. Follow the numbers…they’ll tell you what to do. Don’t assume it’s time to sell just because the fund manager changes if your strategy is performance-based. Follow the numbers…don’t try to predict what they’ll be. Having said that you might want to sell your fund when the manager is replaced if you are a long-term performance investor. I am squarely against using that method because long term averages mean nothing – but that’s not important right now. If you buy funds based on very long-term results, the manager is important and you should probably switch your holdings if the manager leaves. Again, this question needs to be answered based on your investment method. There is no one right answer. What to do when your investment objectives change. If your goals change significantly it probably does make sense to shift your strategy. If you reach a certain milestone in life and your financial needs change, you might need to change your portfolio. If that’s the case, get to work. Just make sure you aren’t confusing a change in your objective needs with your temporary change in appetite for risk. Even in this case, don’t let artificial milestones sway you. For example, even if you are going to retire next year rather than 5 years from now, that doesn’t necessarily mean you should need to shift your investment strategy. You might still keep your portfolio as is and simply use your holdings to create more income. You figure this out by going back to your financial and investment plan. For most of us, investing isn’t an option; it’s a requirement if we want to ultimately achieve our long-term financial goals. Unfortunately, every approach has its flaws. Asset allocation can help reduce risk on the macro level but it can also lull investors into a false sense of security thinking that they are safer than they really are. Buy and hold can work well theoretically but usually fails because emotions often overtake investors who break the 3 rules and end up on the short end of the stick. Market timing tries to bridge this gap. On the one hand, it can help you grow your money and it may also help protect your assets when the market demonstrates weakness. But on the other hand, this is no guarantee of future results. You probably will underperform using this system during certain time frames. There is no way to escape this. Still, for many people, this is an easier route because they know that they have a safety valve and don’t have to sit there and watch the red ink pile up. Knowing they have a mechanism to steer them clear of potential trouble may help investors hold on just long enough to avoid falling victim to their emotional selves and that is often our greatest financial hurdle. The other investment methods also have their pros and cons. In order to determine the best approach for you, revisit why you are investing – probably to achieve long-term goals with as little risk as possible. If you think you have 10 or more years to live, we’ve seen how important it is to consider inflation. And if inflation is important, we should consider equities as a potential tool to combat that problem. Bottom line? If we are resigned to the fact that we’re going to need equities in our portfolios, we have to also be ready for tough times. If you are very interested in avoiding all risk, determine how much you need to invest in equities at a bare minimum and consider an asset allocation strategy that exposes you to the least allocation to stocks you can find that still allows you to reasonably expect to achieve your goals. If you are the kind of person who never looks at their investment statements, buy and hold might be your ticket. Just remember to dust off your statements at least once a year and re-evaluate your holdings. If you are very focused on making sure you take the least amount of risk possible while growing your money safely, consider market timing as I’ve defined it. You may want to do this yourself or hire someone to do this for you as I suggested. Just remember that nothing is perfect and no matter who invests or how they do it, there are times that will involve losses. Your strategy should dictate your buys and sells. Not your emotions.